If you’re a longtime Linux user, you know how messy it is to burn CDs or DVDs every time you want to try a new distribution and then boot from it. Not that anything is wrong with that, it’s just that a lot of CDs get wasted if you’re a born distro hopper. Moreover, if you’re testing out a Linux distribution, wasting DVDs for every install is another issue altogether. That’s where a USB drive comes in handy. These days you can simply download your favorite distribution, load it onto a USB device and then boot from it. Also, you can install a particular distribution if you like it that much. 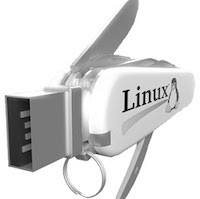 So, if you’re one of those people who want to show off Linux to their friends without messing up their computers, here’s how to run Linux from a USB drive. 3. Windows, Mac OS X or Linux desktop. Download the ‘.iso’ image: Whether you’re installing Ubuntu or any other distribution, you’ll have to first download its ISO image for the live CD/DVD. We will then burn this image onto a USB device and then boot the OS from it. Save that file at some location you’ll remember. Download and install UNetbootin: Whether you’re on Windows, Linux, or Mac, you can download the open-source tool UNetbootin for free. The site offers downloads for Linux users of almost all popular distributions including Ubuntu, Fedora, openSUSE and more. For Windows and Mac users, installing the tool is just a one-step process. Download UNetbootin from HERE. Burn the ISO image to the USB Drive: Now that you have downloaded the image and also installed UNetbootin, it’s time to burn the ISO image to the drive. 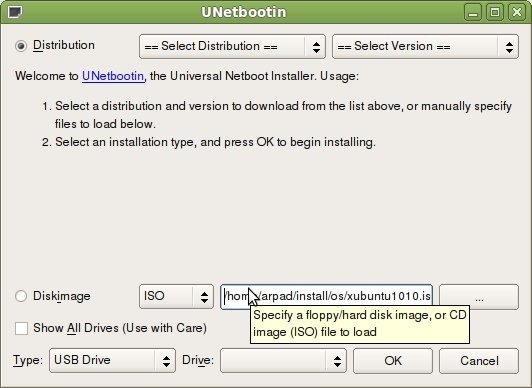 To get started, simply open up UNetbootin. Then insert your USB drive. Also, do make sure that you have no important data on it. On Windows, press the Windows key and search for the application’s name. Once loaded, mention the path of the ISO that you have downloaded in step 1. 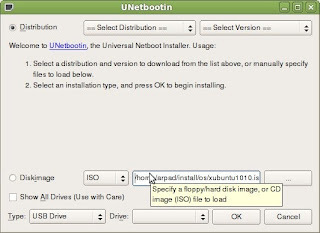 Then, give the path of the USB Drive and click OK.
UNetbootin will start installing the image onto the USB Drive. Just wait till it finishes and then close the installer. Finally once you’re done, reboot your computer with the USB drive still in the USB slot. Usually, if the BIOS is set to boot from USB devices, everything will go smoothly. If not, then in that case you’ll have to manually change the settings. Also, if your BIOS doesn’t let you boot from USB devices, How-To Geek has a nice article on a workaround for that problem. Other than that, there isn’t much you need to do. You may also check out our other articles about some alternate and harmless ways of trying out Linux. Make a multi-boot USB drive. More fun.